I’m reviewing a product we’ve had for almost 3 years now. I actually thought I’ve reviewed it before since I do talk about it fairly frequently, but it looks like I’ve been mistaken. 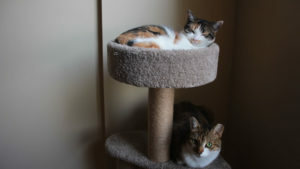 We’re the proud owners of both the Catit Sense 2.0 Food Tree as well the original (which is no longer in stock), and I must say the improvements have been amazing! If you have a fast eater who either throws up immediately after eating or doesn’t pace themselves throughout the day, this may, in fact, be the product for you to use. 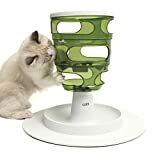 You may also want to grab this product if you have a kitty who enjoys a challenge or is playful as it will help stimulate them! When we first rescued Beau he would gobble up any food he could get his little paws on this often caused him to gag and begin the process of throwing up. If you don’t have a fast eater, consider yourself very lucky, it can be scary to experience if they’re a full-on vomiter. Within the first week of having Beau, we also realized he had Pica and while he passed all of his physicals, we had to get to the bottom of why he may be chewing our bedsheets, clothes, his toys, etc. Our old vet had no information to give us so my sister and I took to the internet to find ways to get him to stop chewing. Seeing that feeder toys were a great way to keep them occupied she suggested the Catit Sense Food Tree, which she had already been using on Avery and we thought… hey! Might as well try! Basically, the main difference between the two is the top. Notice how the original had a large circular opening, which Beau would stuff his face into instead of interacting with the actual toy. Honestly, this wasn’t a huge issue for us, because we put a huge textbook on the top so he couldn’t get to the food easily anymore. At first, we were nervous that Beau would find a way to drop the textbook and hurt himself, or would jump onto the toy toppling it over, but that never actually happened, so we were safe! The new toy features a slimmer opening, making sure that your kitty can’t reach inside. 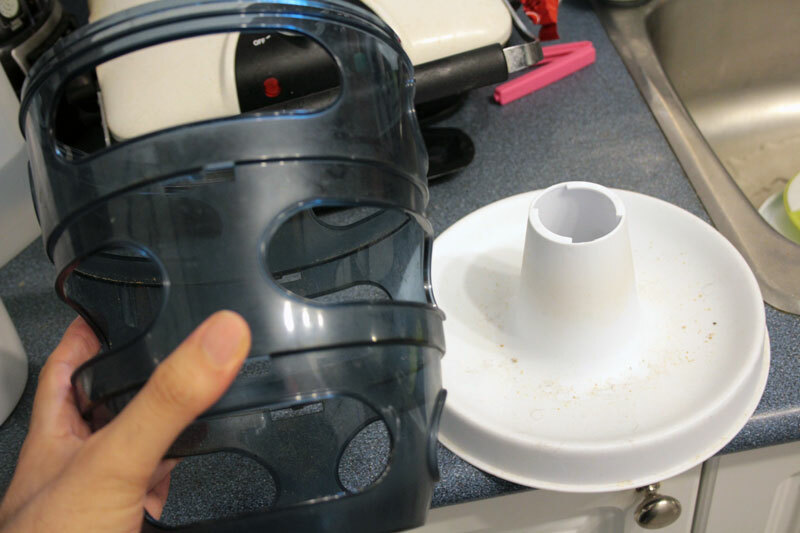 It’s also safer in general, in case your little one has a big head as they could have gotten their head stuck in it. 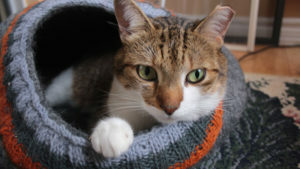 You’d be surprised how many kitties have gotten their heads stuck inside of toys leading to a number of emergency vet visits. Otherwise, everything else seems the same. 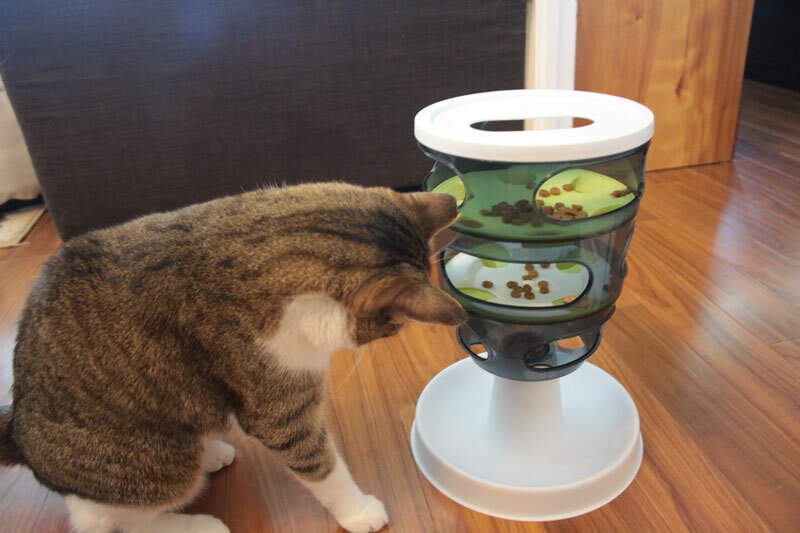 How long does it take for your cat to get the food out? Was it hard to teach your cat to use it? No, it wasn’t at all. Honestly, all I had to do was pour the food in and drop a couple of pieces of kibble down the layers. Beau then started pushing the kibble down copying me. Beau is usually a quick learner, so we weren’t worried, but funny enough, even now when we use it (and treat him with urinary safe kibble) he takes his time with it and Kalista doesn’t seem to want to try to get it. Now, for us, this can mean two different things. Either she’s not interested in his kibble since we already know she’s a picky cat, but it can also mean that because we didn’t take the time to teach her and she hasn’t had the opportunity to watch Beau do his thing and copy him. This means we can make sure that they each eat their own kibble as we don’t want to take chances with Beau eating her kibble since it’s not suitable for cats with UTIs or cats who have undergone Double Cystotomies/Perineal Urethrostomies. 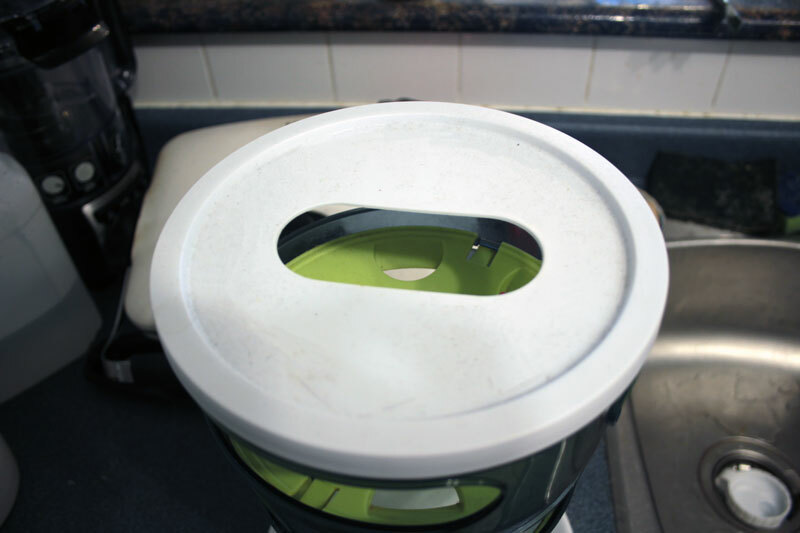 This is one of the easiest cat feeders to clean. 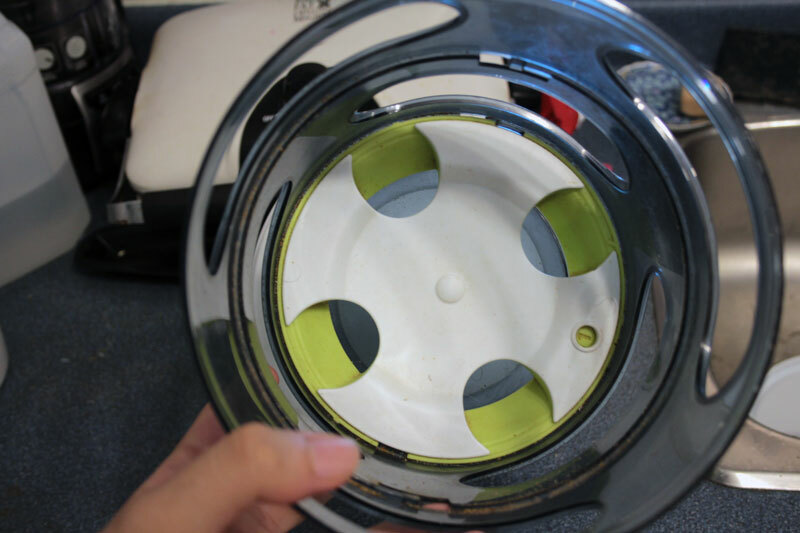 Each layer has a rotating clip (I don’t know how else to describe) to take it apart and clean. I’m not sure if it’s dishwasher safe, to be honest, but I don’t see why not. 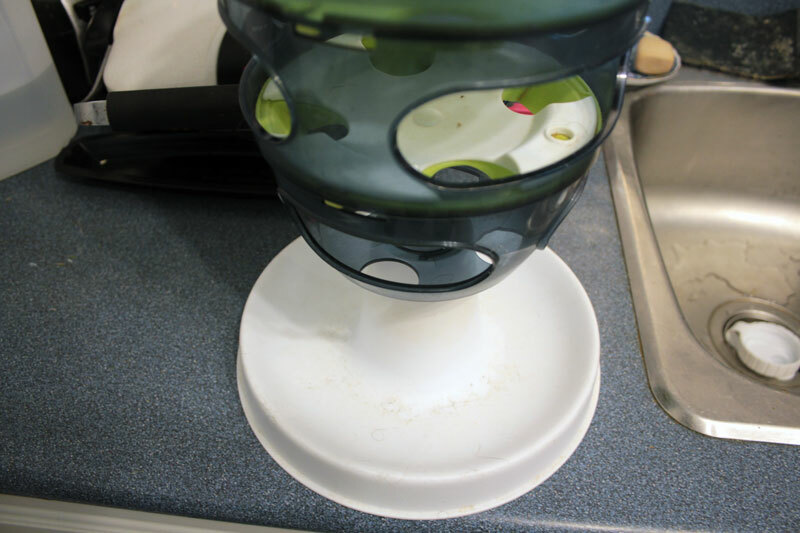 We’ve always cleaned it by hand because we don’t usually think to load it into the dishwasher. 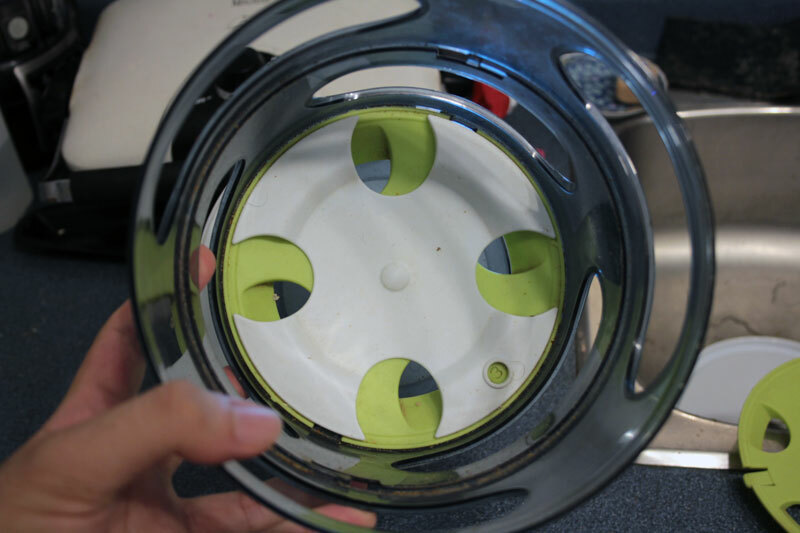 The coolest thing about this product is it has different difficulties which can be changed by rotating the layers and closing up the holes. 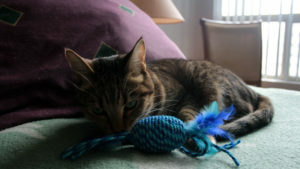 It’s similar to how the SlimCat Ball works, although it’s much easier to clean than the SlimCat ball is. I honestly rate this toy a full 5/5. There’s nothing bad I can say about it. It’s durable, it’s fairly challenging and it’s lasted us years. 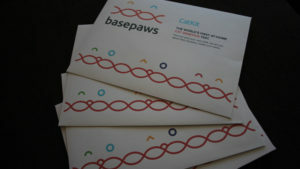 Obviously this is going to be different for each cat, but it’s a perfect fit for our family. 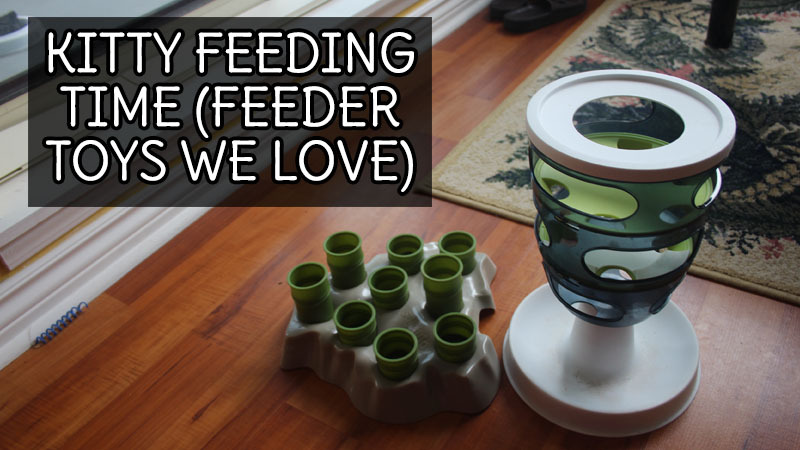 So pet parents, have you ever tried this feeder? What did you think about it? That is a great idea, I should get one for Joanie.